Dry skin, medically known as pruritus, is a common symptom that is often linked to itchy skin. The body produces a natural oil called sebum. When sebum is depleted, skin becomes dry and itchy. There are several common reasons for itchy skin, including environmental and internal factors. Fortunately, there are many natural moisturizers that can treat itchy skin. This article highlights the common reasons for itchy skin, as well as some remedies. Long, hot showers may feel good, but they can be harsh and dry out skin. Washing your hands too often can also cause itchy, dry skin. High stress levels release a compound called histamine, which causes itching, flushing, and sometimes rashes. Reducing stress through exercise (yoga, dance, martial arts, etc) and meditation can help alleviate menopausal symptoms. This may seem like an obvious cause, but many people don't consider it's relation to itchy skin. It is important to stay hydrated to promote skin health. Winter weather can be very harsh on skin, the low humidity causing it to dry out and crack. Stay moisturized, especially during cold weather. Also called dermatitis, this is a chronic condition that causes skin to dry out and itch. Psoriasis is another skin condition that causes scaly, itchy skin. Thyroid problems can affect the sweat and oil producing glands, which may dry out skin. An underactive thyroid (hypothyroidism) causes the body's metabolic rate to decrease, which can also affect the ability for skin to grow and replace itself as it should, causing itchy skin. The “squeaky-clean” feeling is not good for your skin. 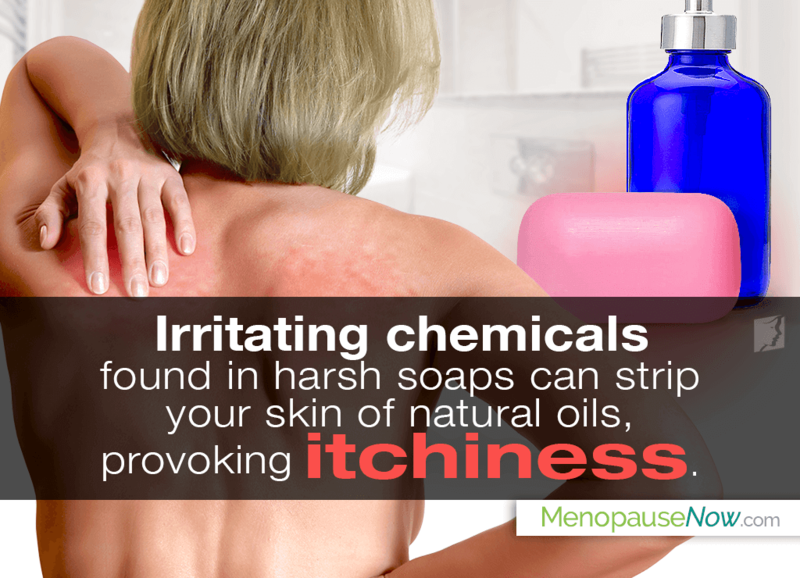 Harsh soaps can strip your skin of natural oils. Food allergies or an allergic reaction to certain substances (like cosmetics) can cause itchy, irritated skin. Some people have bad reactions to certain medications that can cause itchy skin and rashes. Coconut oil. Coconut oil is a natural moisturizer that can nourish dry, itchy skin. It's antimicrobial and antifungal, so it cleanses and protects skin. Avocadoes. Avocadoes are a rich source of essential fatty acids beneficial for skin and hair. Oatmeal. Oatmeal is soothing and moisturizing, and can help relieve itch and nerve pain caused by cracked skin. Adding ground oatmeal to a warm bath is a traditional itch-relief method for the chicken pox. Apple cider vinegar. Apple cider vinegar can help treat dry, cracked, and infected skin. Just dilute some apple cider vinegar onto a cotton ball and rub it onto the affected areas. Itchy skin is irritating and uncomfortable. It can be caused be a number of things, including hot showers, too frequent washing, cold weather, or harsh soaps. Moisturize often in order to prevent itchy skin. Natural moisturizers that are beneficial for healthy skin are coconut oil, avocado, and oatmeal.